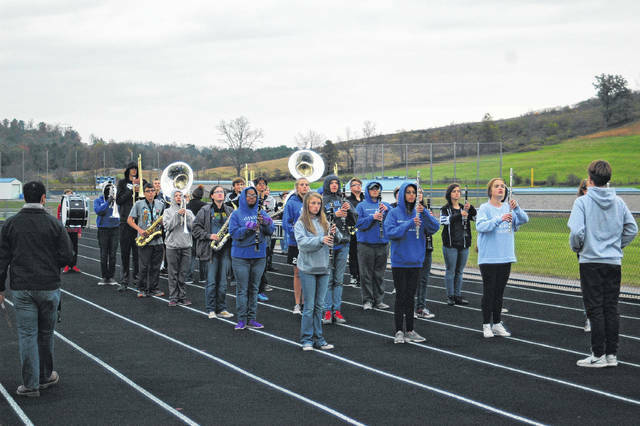 CENTENARY — Gallia Academy High School Marching Band has earned superior marks, qualifying them for competition at the state level. At 53 strong, the marching band will travel to Brunswick, Ohio on Nov. 4 to compete. In the OMEA competition circuit, bands are rated from 1 to 5, with 1 being a superior rating. They are judged in six categories; music, visual performance, visual effect, general effect, color-guard, and percussion. Each band has to perform to a certain standard in each category in order to achieve a superior rating. During the competition season, the band improved their score by 42 points. “By growing 42 points in a season, and 32 since their last contest is almost unheard of,” said John Barrett, band director. This level of excellence comes in light of some worries about the experience in the band. Of the 53 members, over half are first year players. The group overcame a lot of obstacles to achieve a superior rating, working hard on a daily basis. The group practices more than two hours daily to perfect their show. Despite the superior rating, the camaraderie is the greatest benefit for many of the students. “At state you’re competing against other bands, but you’re also competing against your past rating,” said Thomas Hamilton, field commander. The group has not received a superior rating at the state level since 1997. They did compete at state in 2015. “It means a lot to me because we put in a lot of work to meet our goals,” said Loveday. Many of the students are proud of the superior rating, but are eager to compete more. They competed at four competitions this year, earning a one at the last event in Ironton.